If you are going to renovate your bathroom, then it is for sure that you have several options in your mind. Many aspects keep on hovering. What needs to be done? What needs to be implemented to increase the value? How the things are to be adjusted for the better look? What all things are going to make the bathroom look upgraded? Well, it is for sure that the things need to be appropriately implemented to make sure that nothing goes wrong and the investment being done is fruitful. With each of the elements of the bathroom playing their role- the bath, the basins and the aesthetic elements- everything needs to be precisely done. During the restoration of the bathroom, special care needs to be taken for the floors too. Ensuring the right kind of flooring is done so as to uplift the look of the bathroom. The tech development has paved ways for the different flooring options. The things have been little cheering with the tiles being the most preferred options for the flooring. The different types of tiles available have made people to ‘play with tiles' during their bathroom renovation. All kinds of modern bathroom refurbishments take into account the use of the wood look tiles in Perth. People consider this to be one of the trendiest and the best ways to get the things done with perfection. Wooden finish is something that is loved by every people across the world with the condition that the product has the texture that exactly matches the pattern of the original wood. The technological development has made things easy and precise. The manufacturers have been successful in giving the right measurement and precision to the look of the tiles. With the grains and the colours matching exactly with the original one, the wood look tiles have, therefore, been the apple of the eye for most homeowners. Well, renovation must never be like beating around the bush. Right from the floors to the baths and the other essential bathroom accessories, everything has to marry each other. In most of the cases, bathroom renovations in south of River, Perth includes making a match with the things or introducing the items that are completely contrasting. Renovators say people are opened to both options as this type of tiles are versatile and fits in any place. The trendy look need not compromise with the finishes and durability. Therefore, to make sure that the bathroom has the best waterproofing and the materials used are not susceptible to the leakages and the water absorption, the tiles stand out to be the best option to stop the water seepages. The tips mentioned above are some of the best ways by which you can revamp the look of the bathroom. It is the look of the tiles that becomes the deciding factor during the reformation. Therefore, the right type of tiles needs to be purchased along with the texture. The First Rule Of Avoiding A Bathroom Renovation Nightmare Is Finding A Trustworthy Renovation Service Provider. BUT WHAT DO YOU DO, WHEN YOU CAN'T FIND ONE? There's no point hiring shoddy bathroom renovators who rather than transforming your bathroom appearance, piles on more misery for you. The worst case scenario is when your remodelling contractors flee the scene of the work leaving your work only half complete. Keeping all these possibilities in mind, you need to invest plenty of time in finding who your reliable bathroom renovation agency is! Though the task is nothing less than an ordeal; it is by no means impossible. All you need to do is follow these key parameters mentioned below! A lot of people don't research their service provider's website before hiring. Don't make that mistake especially if you are ready to pay the big bucks. Going through the about us section ensures you get a good background info of your chosen company. How Many Years Have They Been In The Industry? What Includes As Their Specialties? Do They Just Renovate Your Bathroom Or Other Parts Of Your House? And If They Are A Certified Agency As Per The Laws Of The Region? Just because you are ready to pay the big bucks doesn't mean that you have to. Remember one thing that the top companies offering bathroom renovations in Perth will never make you spend more than the necessary. Plus they will always live up to your quality expectations (even surpass it at times). You should contact your chosen agency and seek a free service quote. And with that, you should compare their rate with the other similar service providers in the region. Your aim should be to check if the rates abide the industry-standards. If they do, then call up the agency and straighten your renovation requirements. This is one important parameter because it can possible down-size your expenses and improve your service experience. Think logically - You are anyway paying these renovation contractors their service charge. And if you have to look elsewhere for say porcelain tile, wood grain or sandstone tiles; the expenses will only pile up. On the contrary, if you opt for a company which supplies you the renovation materials and also sends out their specialists to carry out the task immaculately; you end up saving a lot of money. That's why do check this aspect too when sorting out your options. Generally, you also get discounts on bulk purchases from such top-rated agencies, and if you are lucky, you may just bag one too. Finally, you should not miss out on checking what their previous clients had to say about their supply and service quality. That gives you a good perspective as to whether the company is a good fit for you. Simple tips but very effective in helping you find your trustworthy agency for quality bathroom renovations in the North of River Perth. Use them when you begin your search. It will make the whole process simple. 'Direct Tile and Bath' is one good place to start. You can speak to their experts about your renovation expectations and also seek for their free price quotes. Why Should You Pick Subway Tiles For Bathroom Renovation? A lot of people take a step behind considering the hassles and expenditure of bathroom renovation even at times when it is an absolute necessity. However, it's high time to think about it with seriousness and this time in a smart way. With so many varieties of bathroom tiles along with the differences in their pricing, it will not be that hard for you to settle down for something that is affordable yet apt for bathrooms. When it comes down to finding something most suitable for redecorating the bathroom without exceeding the budget, subway tiles in Perth are preferably the best choice for you. A lot of people may discourage you in this case as they believe these tiles to be too simple and there is no uniqueness in the flat tiles. Moreover, they also tend to think that these tiles have become old-fashioned and do not go well in the modern sphere. Read on to find out why these particular tiles have made its way to become the most popular choice in the modern time despite being so simple and minimal in style. As you research for finding out the pricing list of the several tiles, you will undoubtedly pick the subway tiles over any other option considering its low price. However, just because these tiles come at an affordable price that does not mean the quality is compromised in any way. The tiles are equally sturdy and high quality like any other tiles. Well, in the contemporary setup, going minimal is undoubtedly the new trend to be followed. Subway tiles are simple in appearance. With the subtle yet stylish bathroom fixtures, the minimalistic design of the tiles matches perfectly. All you need to do is to choose the hues of the tiles smartly to make sure it serves your purpose in the best possible way. 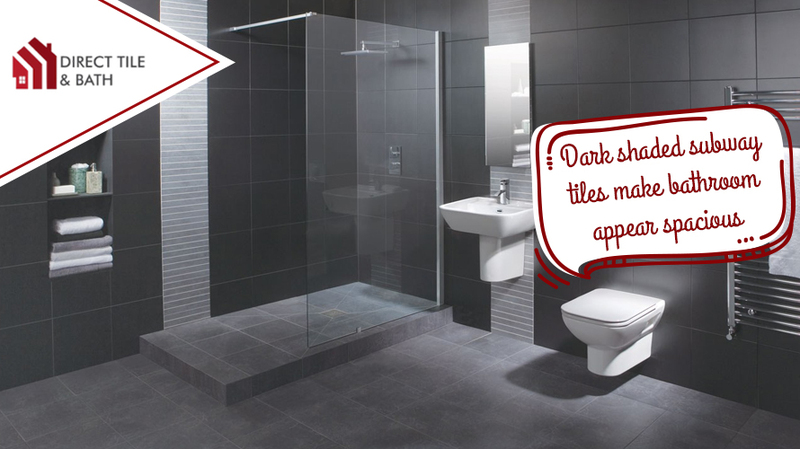 Have you seen any bathroom in the recent times that have dark shaded subway tiles? It will create a visual illusion under which you may think that there is more space in the bathroom even if it is not there. Consider choosing the black tiles for creating a dramatic feature wall in the bathroom where you have installed the shower and make your small bathroom appear spacious. Subway tiles are small and rectangular. Therefore, you can try creating practically any pattern with it. From creating the traditional brick style to install it in a crisscross pattern, you can opt for any of the designs you need. You can also experiment with the colour combination by putting two or three different coloured tiles together to create a distinct shape. It's simple and easy to deal with the cleanup of these tiles. The grouts of these bathroom tiles can be easily cleaned with a brush and wipe the entire thing off with a fresh towel, and it is cleaned. It is recommended to ensure that the cleaning agents you are using for the maintenance purpose are not reactive to the material. Remember to choose the other bathroom fixtures accordingly so that the tiles do not appear out of place and you can get the desired result. Find out the best deal and opt for it as soon as possible. Some Bold N Beautiful Bathroom Designs with Subway Tiles - GO BEYOND!